Although disposable diapers have been popular for a long time, the traditional cloth diaper method is making a come-back by new parents concerned with a reasonable diaper budget or a green lifestyle. 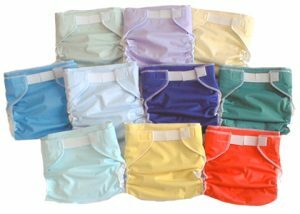 Cloth diapers are generally assumed to be the less expensive method and environmentally friendly option, this is debatable. Let’s take a look at the specifics. When it comes to the baby budget, it seems that cloth diapers win out. Disposable diapers run in the range of $50 to $80 a month. Disposable diapers are thrown away after use, so they need to be bought again and again. Using cloth diapers runs about $25 to $60 a month, if you choose to launder at home. The initial investment is a little more costly: quality cloth diapers cost around $15 a piece. Babies need a fresh diaper 6 to 10 times a day, so in order to get through two days of diapers you might need to spend $300 initially. After that, you need to consider the cost of the water to run the washing machine, the laundry soap, dryer sheets, etc. There is another option with cloth diapers: diaper service. A diaper service is a company that collects, washes, and returns your cloth diapers. This is a great tool for busy moms who want to use cloth diapers for other reasons, but don’t have the time or ability to wash cloth diapers at home. There is also a certain “ick” factor about washing your own cloth diapers that some moms want to avoid. The diaper service runs about $50 to $80 a month as well. Clearly, washing cloth diapers in the home is the least costly option. But it is also worth considering how much your time is worth. As a new parent, you already have a great time of work to do. Is it worth another $25 a month to avoid the extra work that washing your own cloth diapers bring? If you’re answer is yes, then disposable diapers may be the wiser choice after all. As far as the environment is concerned: at first glance, cloth diapers seem to be the winner. Obviously disposable diapers go to landfills, and don’t decompose easily. Cloth diapers are reusable. The water used washing them goes to waste treatment facilities instead of landfills. Disposable diaper waste sitting in a landfill could get into our ground water, contaminating it. But the argument has been made that diaper services negate the environmental benefits of a cloth diaper. A diaper service has to pick up the diapers, wash them en masse, and take them back to the user. The chemicals used to clean the diapers, the carbon emissions from the truck, and the contaminated water, some say, make cloth diapers less earth-friendly. But if we want to look that closely at disposable diapers, we would also have to include the factory pollution from where they are made, the carbon emissions from supply trucks all over the country to put the diapers on shelves, and the disposable wipes that are often used hand in hand with disposable diapers. While there does seem to be a reasonable argument both ways, it seems that cloth diapers are not only a better financial investment, but a better investment for the environment as well. I know that I personally wouldn’t have had the time or patience to really make cloth diapers more affordable. I paid for the convenience of disposable diapers, at the cost of the environment.